I am the fairest person in South Florida (pretty sure that’s a fact), so I don’t play when it comes to sun protection. I also hate the sticky, heavy feeling that traditional sunscreens can give. Enter Supergoop! – my new skin saver! The Supergoop! 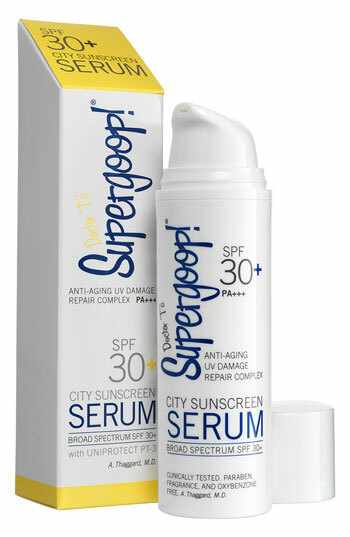 City Sunscreen Serum is a light yet powerful serum that glides on smooth without that pasty sunscreen feel. Both a moisturizer and a broad-spectrum SPF 30, it fights the signs of premature aging (like fine lines and sunspots) and prevents future photo-damage from UV rays. Supergoop!’s unique Hydrovotin 24 complex works with the skin’s own moisture mechanisms to increase hydration levels, while vitamins E and B5 heal past damage. This sunscreen serum is also paraben and fragrance-free — just what the doctor ordered for sensitive skin. It’s great for layering under foundation, but the mattifying formula can also stand alone on the days you’re not wearing makeup. I discovered this beauty in the October Birchbox that I loved so much. The travel size I received is totally purse friendly, and I will definitely be replenishing my stash with the full size version from the Birchbox shop when it runs out. Speaking of which, if you’re a big shopper like I am, you will love the Birchbox loyalty program! The more you shop, the more points you earn. The Birchbox Points program is designed to help you get the most out of your membership. You get rewarded for doing the things you already do: shop on Birchbox.com, refer friends to the program, and send feedback on your samples. Best of all, the points you earn can be used to purchase more full-size products! But wait – there’s more! These awesome benefits I just mentioned aren’t just for subscribers. Birchbox is a great e-commerce destination with unique perks (like free shipping on sampled brands every month as well as the loyalty program) and is available for subscribers and non-subscribers alike. But it’s more fun to subscribe. For more deets on Birchbox (and how addicted I am), click here. Happy shopping!